Dimensions 2 by 7.50 by 9.25 in. It's like a Web-site-in-a-book! First, there's some Web site insight to help you decide what you want your site to do. Then it's into the nitty-gritty of making it happen - building with Dreamweaver, adding animation with Flash, enabling collaboration with Contribute, using ColdFusion to access databases, and a whole lot more. About: Your one-stop guide to six great Macromedia tools for building Web sites It's like a Web-site-in-a-book! 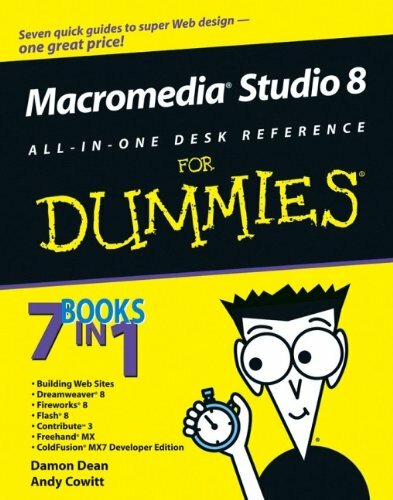 from For Dummies (April 5, 2006); titled "Macromedia Studio 8 All-in-one Desk Reference for Dummies"